Sometimes it's the little things that bring the most comfort, don't you think? Daniel and I love love love to get fortune cookies. On our honeymoon we drove up the coast from my home in Southern California to his home in Seattle, Washington. We stopped in San Francisco and picked up a huge bag of fortune cookies in China Town. It's just one of our little things. The cookies are so so but the fortunes are delightful. Anyhow, we went out for sushi the other night and we both received this matching fortune. I've spent most of the past month feeling under the weather and stressing a bit about upcoming change (getting older, moving, etc.) in my life so this fortune meant something special to me. We are getting ready to pack up our cottage and move to a little house that is closer to campus (where Dan works). Dan says that we don't need to start packing until the day after my birthday next week. I know he's right but I'm feeling anxious and feel like I need to get started. Instead, I am going to go cuddle with my Bono Baby and enjoy my last week of my 35th year. 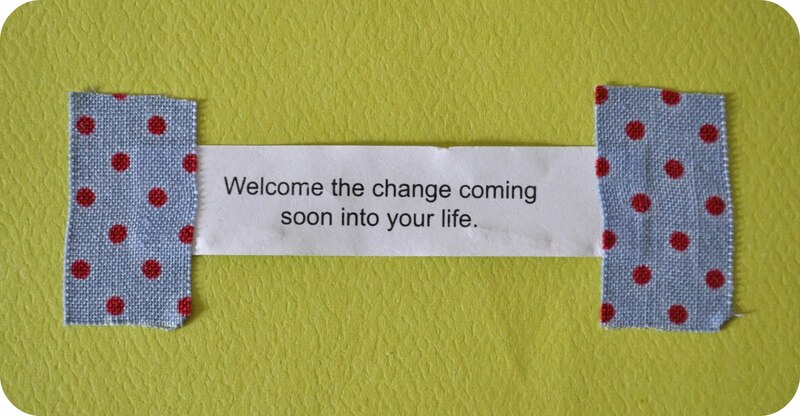 Here's to facing the changes in life gracefully and fortune cookies. How exciting! A new adventure awaits you....lots of nesting to be done for your new place. Are you loving Auburn? Thinking of flying with Lauren to see my brother in Atlanta this fall...would love for us to meet up somehow? I miss you! Atlanta is just at hop, skip, and a jump away. I'll be there with bells on to see you and pretty Lauren. I'm excited for all your changes! Birthdays are for wishing and now you will live closer to me so we can spend more time together. Love you! i cannot think of anyone who lives a more graceful life! to david bowie, birthday wishes, and definitely more fortune cookies! love you and miss you. How perfect that you both got that fortune...things like that make me certain that someone or something is looking out for us and sending us messages. I hope you have an amazing last week of 35. 36 is going to be a magical year!! !